On September 12, the Turkmens celebrate Ruhnama Day. Ruhnama (The Book of the Soul) is a book written by the former President of Turkmenistan Saparmurat Niyazov. Saparmurat Niyazov was the first President of Turkmenistan. He is considered to be one of the world's most totalitarian dictators. The creation and promotion of Ruhnama was Niyazov's attempt to promote native culture and guide the people of Turkmenistan with his ideas. Ruhnama combines autobiography, revisionist history of Turkmenistan, and spiritual and moral guidance. Many facts stated in the book are of dubious or disputed accuracy. Ruhnama was designed as the spiritual guidance of Turkmen nation. Knowledge of its text was required for passing exams in schools and universities and holding any state employment. It was even impossible to get a driving license without knowing Ruhnama. 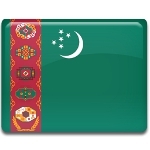 During the Niyazov era, Ruhnama Day was one of the most important public holidays in Turkmenistan. Its date, September 12, was chosen to commemorate the day Ruhnama was first released in 2001. However, when Niyazov was succeeded by Gurbanguly Berdimuhamedow, the importance of Ruhnama began to decline. Ruhnama Day was removed from the list of public holidays, but it is still observed by many people.